On 26 March 2015, outgoing London Mayor and current Foreign Secretary Boris Johnson issued Mayoral Decision MD1478. Based on a cost estimate only 50% likely to be correct, London agreed to fund a transport project, with no cost ceiling, that primarily benefitted a Conservative marginal seat outside of the capital. Four days later, Parliament dissolved for the 2015 General Election. The project is the Metropolitan Line Extension to Watford Junction, the fate of which now hangs in the balance. And for almost a year, the Government and the current Mayor of London have been locked in a quiet stalemate over the consequences of his predecessor’s promise. Today, thanks to a rules and laws that can trace its origins right back to the dawn of the railway age, a final decision will need to be made. If not, then the extraordinary ten-year saga of the Metropolitan Line Extension will likely draw to an end – and it will remain unbuilt. In 2008, Hertfordshire County Council officially approached Transport for London (TfL) with an innovative idea. They wished to connect Watford town centre to the end of the Metropolitan line. To do this, they suggested using the alignment of the old Croxley Green Branch line. The current Watford Metropolitan line station would close and Metropolitan line trains would instead be sent on a rebuilt line along this route, stopping at two new stations before terminating at Watford Junction. The possibility of using the alignment for this purpose had been mooted before. The problem was that it was a project that London Underground (or TfL, their parent) were never likely to fund themselves, for the simple reason that the primary beneficiaries wouldn’t be Londoners – they’d be the citizens of Watford, just over the border in Hertfordshire. If the idea itself wasn’t innovative, Herts solution to finally getting it built was. They asked TfL for permission to design, finance and build it themselves. In return, TfL would ensure that sufficient trains were ordered as part of the upcoming S-Stock rollout to cover services on the line. They also asked that TfL remit back to the Council the fares collected from that stretch of the line until any debt Herts had taken on to fund it had been repaid. Herts hoped this debt would be minimal. The plan was to ruthlessly police project costs and build only the absolute minimum amount of infrastructure required. They also hoped to secure the majority of the funding from local developers and other sources, such as local transport funding pots controlled by the Department for Transport (the DfT). TfL provisionally agreed to Herts’ proposal and the Council commissioned a cost estimate for the work. At £170m, it was higher than they hoped. More critically, at that price point the costs outweighed the forecast benefits to a level that tripped the DfT’s rules on investment – unless they could be lowered, there would be no chance of securing the bulk of the money from the DfT. Herts continued to work on the project, however, and in 2011 returned to the table with a more tightly scoped project. This time, the projected price was £115m. This was low enough to creep it under the DfT’s limits, who committed £76m to the project. Herts were able to source £7m of developer investment to add to this pot, and undertook to cover the remainder of the costs themselves using the debt model they had proposed to TfL. In 2013 a Transport and Works Act Order (TWAO) for the project was issued by Parliament. Contracts could now be issued and work could begin. It wasn’t long before issues began to emerge. Once the TWAO had been issued, Network Rail – Britain’s railway infrastructure manager – carried out a full assessment of the project at Herts’ request. in 2014 they delivered this to the Council, along with their estimated cost for the works. They priced it at £230m, more than double the amount the Council had estimated. To make matters worse, the Council were already struggling to manage their contractors, so that bill was continuing to climb. 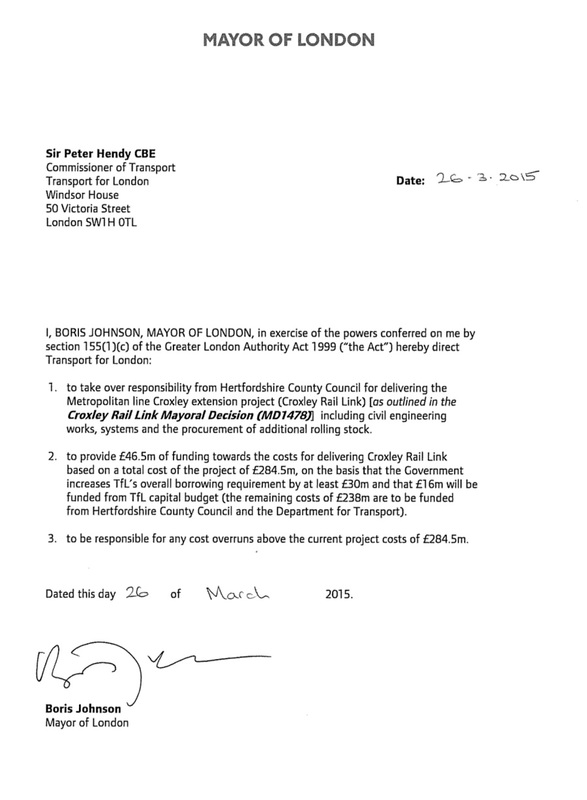 At the end of the year, Herts returned to the DfT to request more funding. Initially, it seemed that they would receive little help. The Benefit to Cost Ratio (BCR) on the project had been border-line for the DfT at the original cost. Now, it was even lower. At a time when ‘austerity’ had become the buzzword of the era and the Department’s budget was being squeezed by the Treasury, there simply wasn’t any spare money to give. As the year progressed, however, the position of the DfT – and beyond them, the Treasury – appeared to mellow. At various points in 2014, as the scale of the project’s woes became clearer, the possibility of transferring it to TfL (or more specifically, London Underground) had been raised. With a reasonable track record of delivery, the argument went, and the in-house skill to tender and carry out the work, TfL were the best option for keeping project costs down and actually getting it built. Late last year, faced with significant project slippage and cost escalation, the government asked us to consider stepping in and taking over responsibility for delivery of the scheme. We were clear that a suitable funding package needed to be in place before we would be prepared to take this on. It wasn’t that TfL didn’t think they could deliver the project. It was simply that (having experienced a few painful ones of their own) they could smell a badly costed project from a mile away. Indeed, internally they believed that even Network Rail’s forecast cost was likely too low. Partly because this had been their experience with recent Network Rail costings elsewhere, but also because – as the project had dragged on through 2014 – the situation on the ground had clearly continued to worsen, and there were thus likely more nasty surprises lurking out of sight of the sponsor. Nonetheless, in late 2014, the DfT identified TfL as their preferred delivery agent and TfL were instructed by the Mayor of London to provide an estimated cost for the project. In January 2015 TfL commissioned AECOM to produce an external cost estimate for the project. The resulting report placed a price tag of £284.4m on the extension. The bill had gone up again. Worse, the AECOM report indicated that due to the tight turnaround time required, the lack of access to key project information and the known history of cost increases, the resulting figure could – and should – only be treated as a P50 estimate, according to Treasury guidelines (a fact confirmed, in passing, in this DfT letter from April 2015). In the case of the Metropolitan Line Extension, AECOM and TfL were saying that, in their opinion, the likelihood of it costing even more than £284.4m was about 50%. On 26 March 2015, Mayor Boris Johnson issued Mayoral Decision MD1478. It ordered TfL to do three things. Firstly, it ordered TfL to take over responsibility for delivering the entire project. Secondly, it ordered TfL, for the first time, to commit their own money to the project, to the total of £46.5m. £16m was to be drawn from the TfL Growth Fund (TfL’s ‘special projects’ budget line, which we’ve covered before) and the balance to come in the form of loans. The Decision indicated that the Treasury had agreed to increase TfL’s overall borrowing requirement accordingly. Thirdly, it directed TfL to be responsible for any cost overruns above the £284.5m budget this effectively established for the project. This seems like a reckless statement to make, given that the agency had indicated that the likelihood of it costing more than this figure was equivalent to a coin-flip. Four days later, Parliament was dissolved for the 2015 General Election. At LR Towers, we are normally reluctant to attribute to politics that which can adequately be explained by inertia. This is because once started, troubled transport projects have a tendency to lurch on, even as costs escalate and delays occur. This is often because they require a significant amount of time, money and legislation to initiate and these sunk costs can rarely be retrieved. In the case of the Metropolitan Line Extension, however, it is difficult to see how anything other than politics could have been the primary driver for this particular Mayoral Decision. TfL’s reluctance to take on the project is a matter of record. So too – thanks to the P50 status of their estimate – is the fact that they believed there was a significant risk that costs would increase further. Indeed, had the situation been reversed and TfL approached the DfT or Treasury and requested money for a project based on a P50 estimate, it is unlikely they would have received a positive response. Treasury rules demand that the budget for any project forming part of an agreement must have all of its significant elements reliably priced and risk assessed. To say that a P50 meets these rules is something of a stretch. Then there is the extraordinary decision to make TfL liable for any cost overrun. Interpreted in its broadest sense, with a flick of the pen the Mayor had removed from the Treasury, DfT and Herts Council any and all liability for the project. It was a very bad deal for London and TfL and for nobody else – understandable if TfL were under pressure from their constituents to build the extension, or if it was a critical blocker on work elsewhere, but neither of those situations were true. Nearly all of the negatives of project cancellation accrued to Hertfordshire – more specifically, to the citizens of Watford. The pressure was on the other side of the negotiating table. The Croxley Rail Link will open up new economic opportunities that will have real benefits for people living in and around Watford. Investment like this in Watford is possible because of the Conservatives’ Long Term Economic plan. Richard Harrington’s hard work as a Conservative MP ensured I was aware of this project and its importance to the area. 12 days after this statement and four days after Johnson issued the Mayoral Decision, Parliament was dissolved for the first election under the Fixed-term Parliament Act. Watford was (using the BBC’s definition) a marginal seat in the predicted hung Parliament. At the TfL Board Meeting in July 2015, the TfL Board expressed their concerns again about the impending transfer. They requested that it be noted that TfL had not been given the opportunity to fully understand either the project requirements or its costs. It was agreed that any further cost increases would be reported back to the DfT. A London Underground delivery team was mobilised in September and the first of those cost increases wasn’t long in coming. The team discovered that £2.75m of Herts’ contribution to the project was actually in the form of land – something that hadn’t been clear in the original documentation from Herts or the DfT. Upon investigation, it became clear that this related to two small plots of land. The first was earmarked for a future station car park. As part of the original revenue deal, it had already been agreed that Herts would retain the revenue from the resulting car park. Herts had assigned a notional value of £900k to this plot. The second was a piece of railway land previously owned and managed by Network Rail. Herts were valuing this land at £1.8m in the transfer to TfL. In reality, it had been acquired by Herts from Network Rail for the notional value of £1. TfL asked Herts Council for that part of the contribution as cash instead. Herts replied that they did not have the funds to do so. On 4 November 2015, Mayor Johnson issued Mayoral Decision MD1570, which ordered TfL to commit a further £2.75m to the project. In November, the process of transferring the Metropolitan Line Extension was completed. This finally brought the two-stage main design and works package contract originally let by Herts County Council under the authority of London Underground. During this process, it was discovered that the sunk cost incurred by Herts so far was higher than either AECOM or TfL had believed. By the time the had officially transferred to TfL on 20 November 2015, TfL finance documents show that the organisation had already revised its P50 estimate to £298.5m. It was agreed that work would continue to complete the design stage, but that the rest of the project would be subjected to a full cost review, pending further funding discussions with the DfT and Herts. In Autumn 2016, Taylor Woodrow – the original contractor put in place by Herts – completed Stage 1 design work, acting under the supervision of London Underground. The option to take the project forward with them into stage 2 was not taken by TfL. Internally, it had become clear that a funding gap now existed and no progress had been made with the other project sponsors as to how it should be closed. More critically, London now had a new (Labour) Mayor – Sadiq Khan. With TfL’s own finances worsening and the Mayor under pressure to deliver his own manifesto commitments (which included a ‘fare freeze’ on TfL services), it remained unclear just how committed to the extension the Mayor was likely to be. As we reported in December 2016, the first clear indication as to which way TfL and the Mayor planned to jump came with the release of his first Transport Strategy, which failed to mention the scheme by name. Although public assurances were given by both TfL and the Mayor’s office that the project was on track, LR sources confirmed not just the existence of the funding gap, but also that it was significant. TfL’s private estimates for the project now ran closer to £350m – over three times Herts’ original proposed cost. Since taking over management of the Croxley Rail Link in November 2015, Transport for London (TfL) has been reviewing the main work contracts. From discussions between officials in the Department and in TfL, we are aware that, as a result of prices received from the supply chain, the costs of the scheme are currently higher than the agreed budget. We understand TfL is considering how best to deal with this. Under the terms of the funding agreement in place for the scheme, TfL committed to the agreed budget of £284.4m and so agreed to meet any costs incurred over that budget. Conversely, they would retain the full amount of any cost savings. The Department will not be providing any additional funding for the scheme and expects TfL to complete it as agreed. Since taking over responsibility for designing and building the extension from Hertfordshire County Council in 2015, we’ve done detailed design work and reviewed the costs of the project. This work now shows that the project cannot be completed with the current funding package of £284.4m agreed at the time. Our current estimate is that more than £50m will be needed on top of that. We do not have the funding to cover these additional costs. The Mayor of London believes that the Department for Transport and the other funding partners need to agree how the additional costs will be met. This is now being discussed between the funding partners. The timing wasn’t accidental. Behind the scenes, TfL had finally received their first full report into the likely final cost of the project, taking into account all of the costs sunk into the design stage completed the previous autumn and the work yet to come. Their first, full, review, issued in June, now forecast a total project cost of £333m, with an additional £24m of cost pressures that would require factoring in. And this too was only a P50. The impasse continued. Work on the extension didn’t. On Friday 29 December 2017, LR and BBC Three Counties Radio (who are, understandably, somewhat curious too) made inquiries as to the current status of the funding negotiations. While work remains to identify the remaining funding needed for the Metropolitan Line Extension, the Mayor and his team have had a number of productive meetings with the council and local MPs, with a lot of agreement about how the project can proceed. TfL remains committed to the £49m it has allocated to the project, and work will continue alongside local MPs, the Government and Hertfordshire County Council to find the additional sources of funding required. The Metropolitan Line extension will deliver significant transport benefits and boost economic growth in Watford and wider north-west London. We are continuing to work closely with TfL and local funding partners on options for progressing the scheme. He is in discussions with London Mayor Sadiq Khan and the Secretary of State, Chris Grayling MP, and will be able to confirm the details of the new funding agreement soon. These statements are well crafted. So well crafted, in fact, that they highlight nicely that – although ‘discussions continue’ – the positions of all parties seem to remain the same. TfL will only pay the original contribution they committed. The DfT won’t pay a penny more. There was a reason that we asked on the last working day in December 2017, however – that Transport and Works Act Order issued all the way back in August 2013. If you want to build a new railway, you have to ask Parliament’s permission. Once permission is given, you must show sufficient construction progress within five years, or that permission expires. The terms are modernised, but those same principles still exist within the Transport and Works Act today and various elements of the associated rules and legislation – once a TWAO is issued for your railway (or your canal, if any billionaires reading this are feeling naval) then, to put it simply, you have five years to build enough of it to show that you’re serious. If you don’t, then you will need to return to Parliament and start all over again. 4.3 If no additional funding can be identified in a timely manner, the Transport and Works Act Order (TWAO) powers and planning permission granted in respect of the MLX which are to be implemented by August 2018 may lapse. [F]or TfL to be assured that the programme included a prudent level of contingency to cater for the delay (bearing in mind this deadline is absolute), the additional funding would need to be secured by 31 December 2017. If you are reading this article at time of publication, then that deadline is today. As with all things political, one suspects that TfL’s ‘absolute’ deadline is not entirely absolute. Should a decision be made on the 2 January 2018, one assumes that the TWAO can still be satisfied. Indeed perhaps, behind-the-scenes, an agreement has already been made. As it stands, however, the future for the Metropolitan Line Extension – and the £71m of sunk costs already invested into the project – look very bleak indeed. Regardless of whether it continues or not, one thing is now certainly true. The financing, management and politics of the project seem closer to that found in the era of the Railway Robber Barons than they do to a modern transport project. In a way, it would perhaps be fitting then (although unfortunate for the good citizens of Watford) if it was the legislation created to curb such behaviour in the nineteenth century that condemned the Metropolitan Line Extension to failure in the twenty-first. Can you remember the last time a TWAO lapsed in London due to something like this? Been wracking my brains, but I can’t. Surely Mayoral decision — MD2170 4.3 should read “if NO additional funding” and not “if NOT additional funding”? (4.3 If not additional funding can be identified in a timely manner, the Transport and Works Act Order (TWAO) powers and planning permission granted in respect of the MLX which are to be implemented by August 2018 may lapse). If the money to build the project is not found, then the various sponsors have decided it’s not worth pursuing. £71 million already? OMG – where did it all go? In what conceivable way did the TfL Board privately express their concerns at a board meeting in July 2015? Anyone can walk off the street and observe a board meeting. It is also streamed and recorded. There is no record of any ‘part 2’ on the subject at which the public are excluded. I think you meet ‘discreet’ when you state ‘discrete’ but cannot be 100% sure as discrete could conceivably be valid in such a situation. I think the 5 year rule (or 3 year rule when appropriate) is more related to planning in general rather than being specific to railways. I am not convinced it hasn’t already been met simply some minor works that may have taken place and required the relevant TWAO to authorise the work though I suspect it has to be ‘more than merely preparatory’ as legal bods are wont to say. Also I thought it commenced the day the planning application (or TWAO was approved) and not the end of the appropriate calendar year but may be wrong in this case. Even if it lapses, an authority has to have good reasons not to reinstate it if a further application is made. The logic is that if it was passed previously then there has to be a good reason or some material change for it to be subsequently rejected. Although an entirely valid comment in this case, I think you place too much significance on the five year rule in general. The work at Maidenhead sidings on Crossrail – a discrete item – was brought forward solely because work would not have started within the five year permitted period. The lack of work until then didn’t mean that there wasn’t a serious intention of doing this. Note also that Crossrail have only just started building maintenance facilities at Plumstead. It was possibly fortuitous that this was a separate later application so as not to breach the five year rule. Has there been any investigation as to why Hertford’s initial cost estimate & TfL’s costs are so different? I simply meant TfL didn’t exactly make a big public deal about it. I’ve removed the word to avoid confusion. Fixed the discrete thing (and the other typos others mentioned) as well. And that’s really why the TWAO is important here. I agree that in a lot of cases it doesn’t even matter. Hell, worst case you go back and get another one. But as everything else shows, the Extension is running on gas, under an agency (and Mayor) that don’t want to build it, with a BCR that is beyond terrible now. If it’s not built now, I just can’t see where it gets the backing to get revived at the new price. I’ve always wondered why an actual law, i.e. act of parliament was required to build infrastructure in this country. Once again, London Reconnections provides the answer. I’m sad this looks like it is dead, I would have used it all the time in my youth (had it been built). How the hell one connecting bridge and some patching up work can cost a third of a billion is beyond me. I think the 5 year rule (or 3 year rule when appropriate) is more related to planning in general rather than being specific to railways. Indeed, the Transport and Works Act 1992 and the Croxley Rail Link Order 2013 make no direct reference to time limits for construction, though the related planning permission presumably does (yet, as you go on to note, that does not preclude applications for renewed planning permission). But article 29 of the 2013 Order enables compulsory purchases and taking possession of sites only within 5 years of when the order came into force, i.e. before 21 August 2018. Understandably, TfL would not want to rush into such arrangements, even if TfL (or TfL’s master) had remained politically committed. How the hell one connecting bridge and some patching up work can cost a third of a billion is beyond me. This strikes me as utterly bonkers., but more practically can anyone explain why such a simple project could cost so much – considerably more than the Edinurgh – Galashiels re-opening for instance? @Spinicist: You missed out the three new stations. That’s the expensive bit…. Why not build it without any new stations? Watford can pay for the stations later if they want them. @Southern Heights – All of them above ground, and hardly with restricted access. I confess I have no idea how much these things “should” cost, but with the various reports about costs in the rail industry being higher here than the continent, the recent stories about profit margins in the related house-building industry, I do start to wonder where all this cash ends up. If only LR Towers could get hold of the full costings and do a break-down so us outsiders could understand! If not, then the extraordinary ten-year saga of the Metropolitan Line Extension will likely draw to an end – and it will remain unbuilt. While this, the second or third attempt of taking over the Croxley branch to perform the link (rather than a new build line all the way to Watford), is only 10 years old, it’s merely a chapter or three of a much longer saga spanning at least 30 years. And, as others have pointed out, there’s something fishy about the cost estimates: even the earlier figures from Herts CC were on the expensive side compared to other projects. Thus it might get built when, as the pattern has gone 3 or 4 times before, it gets re-proposed in a decade or so’s time. Another slight issue with this excellent article is “stopping at three new stations” – which SHLR has repeated. Cassiobridge (nee Ascot Road) and Watford Vicarage Road (nee Watford West) is merely two new stations. There might be some necessary works (lengthening) at Watford High Street and Watford Junction, but the platforms exist at these existing stations – they would, at best, be ‘upgraded stations’. Watford council recently approved planning permission on a 24 storey tower block next to one of the proposed stations. If I was to take a wild stab in the dark I’d suggest the development company behind that completely inappropriate monstrosity (current tallest building in that area is about 5 storeys) will be coughing up a fair chunk of the funding to make sure this happens. One could – almost – wish that the possibly-easier option of tunneling beneath Cassiobury Park to the originally-planned Watford Central station was going ahead. At the rate the overground option is increasing in price it might even be cheaper! I still want to know how this very modest project managed to cost more than re-opening Edinburgh – Galashiels. at least 7 new stations & 38 miles. Indeed, and when I went over Cassio Bridge yesterday, I was shocked at the pictures on the hoardings showing a massive development. The FAQ says “Section 106/278 contributions will also go to Watford Borough Council to support inprovements in the area, including to schools, highways and other services.” and “Watford Borough Council and Hertfordshire County Council have attracted some £280m to upgrade the transport infrastructure in order to attract new busineses and employment space as well as much-needed homes.” – it is like they are deliberately avoiding specifically mentioning trains (some of the mock up pictures have trains/the station, and an infographic does too: with an erroneous ’16tph’ figure that I presume is 8tph each way. I guess they are hard to change). I was less shocked that the cones that were about there earlier in the year (from about the time the prep works started in earnest) had vanished. This is my favourite part of this whole saga (which should be retold everytime!) is this bit of creative accounting that is straight out of the “Venture Capitalism” part of the updated New Deal era “2 cows” economic parable. New station at Cassiobridge	…. £350m? I’m at a loss to understand why it cost more for concrete and builders in Hertfordshire. Even if a funding deal is pulled together I don’t see how this project can proceed. There is clearly no viable business case given the costs and the thin at best benefits that were in the last business case I read on the Croxley Link website. Even if you allow for the numbers to be inflated to current prices it can’t possible deliver enough standard benefits to get past the Treasury. This then leaves it as solely a massive political “bribe” by the Govt for the MP in Watford to crow about to his constituents. Is that seat really worth several hundred million pounds? I really can’t see how. It’s all very sad but someone should have had the decency to halt this mess several years ago when it became clear how badly put together the project was. If this was solely a TfL project, like SSR resignalling, the Mayor would be criticised by everyone every 5 minutes just for the political “kick about” as indeed Boris was by the likes of Val Shawcross, Caroline Pidgeon and John Biggs. I wonder when Keith Prince and Gareth Bacon will start “savaging” Sadiq and I wonder what the response will be? @ Briantist – the careful element you leave out of your comparitors is the extent to which many of those projects have cost / will cost many times more than originally estimated. Lea Bridge was supposed to be cheap but cost three times as much as expected with panic measures by Waltham Forest Council to find the money in excess of that it had from S106 from the Olympic Park development and the DfT New Stations fund. Again there were serious errors in determining the scope and properly identifying the risks. Sounds ever so familiar? The works at Hackney Wick are many months late I believe and, IIRC past GLA meeting papers, extra money had to be found for that. STAR was supposed to cost something like £50m (again from memory from past GLA papers). It is now costing £122m and that is on the cheapest, most scaled back scope that can support the train service. It has also run late – largely because of issues in pinning down the funding and also the delays to the GOBLIN electrification which prevented closures on the West Anglia main line. 6 month delays don’t come for free. It remains to be seen if the LU project for rebuilding T Hale with a big shed and a new bridge and a couple of lifts comes in at £20m. It’s not exactly hurtling along at maximum speed although there do now appear to be some holes in the ground. You must excuse my cynicism but none of these projects are exactly paragons of virtue in terms of their cost relative to their scope or their timely delivery / progress. I think this aptly sums up the costs issues and understanding of it. It isn’t exactly a small connecting bridge though!!! High costs and where do they come from? 1. The western end of the alignment is actually different to the old alignment (alignment in both the so it isn’t just a simple connecting bridge. [We’ll ignore the Councils in their various forms over the years has failed to protect the sensible alignment across the gap or the road levels over the years when they were modified all of which has been very unhelpful]. The result is the alignment at the western end is essentially 810m of new railway civils as the new track level will actually be over 6-8m above the former track level on the disused branch in places for the vast majority of that 810m. So in reality it is 8 new bridges with a total minimum span of at least 110m. This leaves 700m of new viaduct often on a narrow railway alignment width which means much of the embankment would have to be heavily engineered to ensure its stability (e.g. lots of piling). That will come to not much less than £75m for starters on that lot given the difficulties when some of the individual structures /sites are taken into account. 2. The quality of the original branch line civils left a lot to be desired so not far off starting from scratch along the minimally altered sections. 3. At the eastern end of the new route just east of the hospital site at the southwest corner of the former triangular junction, there is new Eastern access road to the hospital site completed in 2016 that wasn’t factored into TWAO, presumably this was built to all the requirements of the Croxley Link scheme including the bridge over the route; what will be interesting is if they have got the drainage right when doing the road given the proximity to the smaller channel of the Colne. The local views of the quality of the road scheme and its design appear to be on par or below the councils involvement in the Croxley Rail Link. 1. …(alignment in both position and altitude)…. 5. The councils aren’t good at pricing infrastructure schemes – Tom Sawyer Way (the new hospital access road) cost more than twice what the council though it would but this only emerged after the Hospital had agreed to pay for it. Anything sound familiar? All transport is political so no conspiracy here just degrees. Unlike some larger schemes this is one I would personally use but have to admit the case is poor in finance terms. The overwhelming lesson is how expensive it becomes to reopen a stretch of railway. Those parliamentary trains serve a purpose. To add to the good preceding comment the HCC 2008 reopening plan was just 5 years after official closure. The line had been curtailed from it’s final station by the mentioned road widening and sensibly HCC considered it was not worth rebridging. I had wondered if HCC was just after DfT money for something they had removed but as explained the alignment to connect the two lines is sufficiently different. The costs have been examined closely by different agencies and their consultants, in itself funding a paper industry and increasing costs. The parties names are interesting historically but the agreements are between post holders and their agencies. Rumours today (again) are Boris to lose For Sec, Grayling to move. Minister for Tp is always seen as a stepping stone and few incumbents have an interest, Can’t pick one who was knowledgable – Greening maybe worked at it. £77m/300 project progress means the link is 25% complete! It’s largely fees and modern paperwork is a mountain compared to Victorian projects. Officially Croxley is paused rather than not started. If sidings at the end of a 73 mile project is a ‘start’ then Croxley has had work all along it’s length and rolling stock delivered. The counter would be that major groundwork was on other infrastructure in preparation for something else that was not started and the line work was ‘maintenance’ for evaluation. Any project at a boundary with overlapping responsibilities is more complicated, HCC were to be commended for stepping aside for the partner with greater competencies. If this was in London it would be more akin to Riverside as a regeneration enabler. That side of town lost it’s industry with Scammell and the railway depot. The intended development would also generate more than the peak time flow at Watford Met with leisure and retail use. 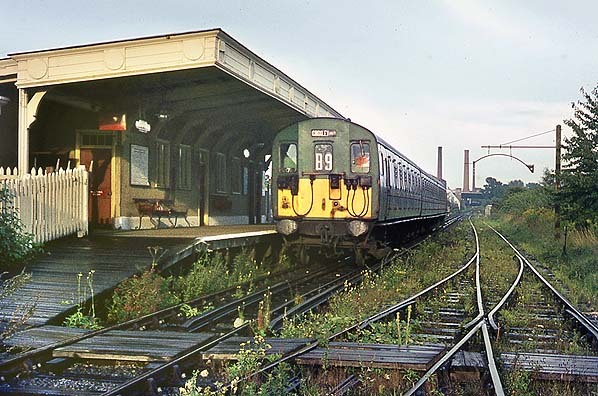 NSE tried with a valid attempt in the 1980s electrification and full timetable which did not then yield expected traffic. No new housing and free parking at the regional hospital back then, Watford FC with tens of thousands at an event is not a traffic generator for a short local train. The Stadium station was more for segregation of visiting fans charter specials. The land acquisition is minor for the resiting of ONE replacement station between those two, one bridge down from West. Some plant, access right of way and the lifts. As with other pauses and political projects it is not the original case that is relevant. It’s the ratio now for the additional spend to complete. The operating cost case after redevelopment is good, remember this is zone 7 to 9. The delay subject to economic uncertainties and future funding receipts is not that important. The building schemes are also delayed, the route is safeguarded and having a user base before operating the railway is helpful. It will be hard to sell a flat in this zone without a written guarantee that the transport link will be provided eventually – but they already have one don’t they? If this project is deemed expired then HCC has flirted many times with light rail even so far as deliberately proposing closure of rail lines to enable schemes. Dusting off their interests here would avoid the expensive bridging by running through a roundabout under light control and add flexibility for more tram stops within local projects. Edninburgh – Galashiels ( Tweedbank ). And, not just Watford, but it seems, all of the others too, fall down badly. But, as the Scottish example shows, it can be done, so what went wrong. I suspect NGH’s “venture capitalism” mode might point to an answer? What would have happend if they started building this, but sub-standard, using the allocated money and stopping where they are when the money runs out? Like building everything that anyway needs to be buildt up to full standard, but only lay a single not electrified track with no intermediate stations and let Chiltern run a diesel service Aylesbury – Watford Junction as a first step? It might seem silly but I think that building and starting to use that first part would put much more pressure on everyone involved in getting the funding for the rest of the project. @Miam the new bit is the missing link namely the expensive new alignment. Mia: various things wrong with your plan, but the main one is that the already allocated money was allocated for a specified purpose – extending the Met to Watford Junction. It was not allocated for a completely different project like a Chiltern diesel-operated line, so spending it on that would be completely illegal and would quite correctly constitute a sackable offence for anyone who so misused the funds. Alecks: the link is certainly not 25% complete by any reasonable standard. 25% of the funds may well have been spent, but that is an entirely different matter. It will not be hard to sell a flat “in this zone”. Any housing anywhere in the south-east of England will sell. The existence (promised or actual) of a particular transport link will affect the price, that’s all. The sunk costs will include the additional S8 unit they ordered rather than just devegitation work on the ground or design related work or paper pushing. Any bets how much HCC didn’t spend on soil surveys ( an old LR favourite…) and the local geology is that great. @ Alecs2CV – HCC are to be commended? Really? Looks to me like they knew they were in an almighty mess they couldn’t get out off. Hey presto Boris and George appear over the horizon with an open, never to be exhausted cheque book. Of course they stepped aside. Wouldn’t you? @ Greg – I am afraid I don’t view the Borders Railway as being directly comparable. It’s a simple railway built mostly in the middle of nowhere with few constraints on construction. It’s got a few very simple stations on it, is not electrified, does not have to mesh into two signalling technologies, cope with two standards regimes etc. Trying to make national or international comparisons on costs is fraught with difficulties as anyone who has ever tried to “benchmark” such things would know. Every scheme has its own issues and risks – the Met Line extension is probably a text book example of how not to plan / build a tube extension. I was a board member of TfL from 2012 to 2016, and a member of the Finance Committee. Many times we expressed concern about this project. Although the article is broadly accurate there are some errors. Particularly the length of discussions. Both Management and the board had very severe doubts about the viability in any event. I confirm it was totally Government pressure on Boris but there were other schemes that Goverment agreed to fund if TfL took this on. Overall that may, just may, have been good but it was typical George Osborn. Get him out of a hole. If Govt, Herts or Watford want this (and it’s probably sensible). Let them fund it. Given the now is uncertain this project could stay paused for 10 years – arguments aside about whether it’s been started. The political problem about restarting it in a possibly even more inflated cost position would be painful. Stepping over into alternative reality as a regeneration zone are there retired DLR 2 cars in the pipeline somewhere for a circular High St Hospital, shops, office park and a couple of housing stops? TfL gets the farebox recovery from the increase in passengers and, beyond the extra S8 unit they already have, little additional operational cost increase vs the status quo – so, London (which does gain – Northwood, Pinner, etc do a lot of cross-border travel) ought to chip in at least some, while the DfT/Herts/Watford make up the majority. Which is what happened. Now, sure, the business case is gone with the much higher estimates for costs, and no money should be spent unless that changes. But, at the same time, the parochial arguments against London paying at least some of the money are nonsense. And quickly stepping on that set of crayons … you would need install DLR signalling and control systems – which can’t share with National Rail. – and also there is the power problem, because you don’t want to mix the DLR’s reverse pickup system with the Watford DC’s third rail AND the Met’s third rail… !!!! In the days when such things were my direct responsibility, I did give a little (but not very much, I must admit) thought to replacing the St Alban’s branch with a light rail scheme that extended down Clarendon Road to Watford High Street and then out towards Maple Cross via Watford Met. However, the problems of getting under WCML seemed difficult and certainly expensive, let alone the institutional issues. It didn’t seem worth troubling engineering colleagues to investigate further. Actually the DLR Seltrac is similar to that proposed for LU subsurface lines. You’d probably want a proper driving cab position added though. Power conversion would be fairly simple with a change of shoe design. The original DLR cars were converted to standard German high floor ‘Stadtbahn’ trams for manual operation under OHLE in Essen where I believe some of them still ply their trade. might be considered. This could still call at High Street station to serve the south end of the town centre as well as the junction, and head off on the Croxley alignment. If it joined onto the Met though it would still likely carry similar costs. The heavy rail version is no doubt impossible but a LR variant might work using ‘tram train’ (or Tyne and Wear Sunderland extension) ‘light metro’ principles to run through High Street station shared with heavy rail trains. Failing that and an anathema to some I know but another possibility might be to use both alignments in some way for some kind of segregated busway scheme or some more modern rubber-tyred pod shuttle equivalent. Remember that could offer a fast reliable public transport service, which is surely the primary intention howsoever delivered. If we were reaching the Met’s third rail we would not need to consider what to do with the orphaned project. One vehicle or two coupled needs no signalling. You could probably reach the footbridge at the end of the platform of High St station without connecting rails. If you plug into a dock there for 15 mins you could probably recharge the batteries for a 15 minute circuit. Control could be manual or autonomous off GPS = no tunnels. I am very aware that board (and committee) meeting minutes of the previous meeting always appear very sanitised versions of what was actually discussed. There is nothing like being there to pick up on the nuances and concerns – viewing it when livestreamed or afterwards is the next best thing. It is often the tiny comment, not reported or formally recorded, that provides the real insight as to the board’s attitude. head off on the Croxley alignment. If it joined onto the Met though it would still likely carry similar costs. The heavy rail version is no doubt impossible but a LR variant might work using ‘tram train’ (or Tyne and Wear Sunderland extension) ‘light metro’ principles to run through High Street station shared with heavy rail trains. I have walked that alignment. There is a line up to the open meadow and plenty of room under the viaduct arches. However the annotation is disingenuous. It is not a surface alignment, You have to come up to the DC lines after dropping under the WCML. It also crosses a town park which would have to be above ground level. The length of bridging here is many times longer then the problem Croxley gap – which you then have to do anyway. Chiltern could do an Evergreen East West line to Hertford but a cost higher than the other one, not suited for freight, in a more sensitive belt. And Chiltern could get taken off the Amersham line anyway. Everything is doable but no rational reason for it. We are getting to a stage where little can be routed on the surface. The future is subterranean which needs volume. or affluence for Boring Co pods. Aleks2CV et al: The road traffic in central Watford is heavy-to-stationary a great many daytime hours. The idea of sending trams down such roads is, I suggest, a dangerous non-starter. Agree. Trams and guided busways have been repeatedly defeated. The idea of using the existing isolated track with the new development for a segregated way would at least satisfy some connectivity within the regeneration zone. @ Alison W – the other view, of course, is that if you reallocate road space to more efficient modes then you get some modal transfer and some journeys simply stop being made. *If* done properly then a tram service in Watford could work very well. To be fair there is reasonable evidence elsewhere in the UK and Europe / USA that trams can and do offer a decent alternative for car users and persuade them to change their modal mix. The nightmare is getting through the planning and construction phases in as rational and effective way possible. @AlisonW – My engagement with Watford goes back about 25 years and I’m sure you’re right, traffic has increased substantially. insofar as I crystallised my thoughts at the time,I guess they would have involved turning north along the High Street as far as that major roundabout by the hospital/ technical college* (if they are still there), turning east and then going to Watford met in a loop,much as certain 318 s or 319s did and then on to Maple Cross. The thought at the back of my mind at the time was that any such core route could relatively easily be extended down the Colne Valley towards Heathrow and with street running across S Albans towards Hatfield. From the Board’s point of view it got us out of Watford – St Albans, which has always been something of an expensive orphan commercially and operationally. The concept of tramification of Watford S Albans has continued for many years now, but on its own,and without street running at either end, it.s hardly economic either in scale (needs a depot for 2,maybe 3 , sets in service+ a spare) and market served (double change). @MarkT – Interesting – I had not considered whether it was better to pick up the Met, I assumed that the nearer we could get to major local destinations such as the shops and hospital etc the better and that implied street running. Thanks for the site visit report! The Google Earth data has improved significantly since I did those sketches and the detailed heights of the rail embankments and surrounding landscape are now readily discernable. The WCML embankment top proceeds level at about 68m elevation while the DC line at the bridge under the A411 bridge near High Street station is at 60m. The park between the two alignments and the path under the viaduct are at 55m, so a single track lightweight viaduct for a light rail system could bridge footpaths from the DC alignment then utilise the steeper climbing abilities of light rail to dip down on a low earth embankment beneath the viaduct before climbing up the east side of the WCML embankment. Impressed at getting heights online. Exploiting heavy rail in West Watford. The connectivity in East Watford. Converting Abbey Line to tram does not help the commuters into the city. They had a city train in the past, that may have been a slip coach though. Connections were convenient when Southern terminated into an adjacent bay. Problem on all these fast lines is when you connect on the wrong side through running is too disruptive. The Community Partnership really needs to improve usage to build a case. They have just done a kickstarter for a £6k improvement study. It’s a single track with 20min turns. They want to double the frequency but won’t get funding for a passing loop, doing it at the restored halfway station adds cost. The rail renaissance has passed them by. My advice to them would be to split the line at Bricket Wood and run 2 x 3 cars giving a 20min peak frequency, 2tph offpeak. Check & collect fares during transfer. If they cannot prove their ridership over say 3 years then any rail future looks bleak. Only when there is a market can any future be optioned. 1. Timing arrivals at Watford say 3 minutes before halting a semi-fast on the Up fast line between 7-8:30. During peaks when frequency is higher absolute speed is lower. 2. Waiting until HS2 releases commuter space on WCML but any through running won’t be to Euston, Harrow adds nothing, so leaves somewhere at OOC. Through running here does not offer worthwhile gain. 3. At the MML a rail-freight developer Helioslough has permission to build a single south facing dive-under to the slows. Looping a branch after Park St over to the former Napsbury Halt location as a potential St Albans park+ride would pick up passengers. Then connect to the future freight line and stop at Radlett for north connections to St Albans and beyond. Run non=stop through the Elstree tunnels to Silkstream goods lines to clear the Thameslink slows. Stop at Hendon for more connectivity, then Dudding Hill line. Connectivity at Neasden, Harlesden, OOC, Acton, and stop at Kew Bridge for Hounslow loop. Additional stops on the way would be infill like BrentX, Middx Uni. The connectivity makes it worthwhile. Abbey line city commuters would have same platform connection to Thameslink. all too expensive without passengers. Some have potential using one existing platform. This fast becoming a farce to rival the W&C extensions. Got my left & right swapped round. Abbey Line is East. The connectivity in West is Met. For Bakerloo LR asked is it transport or housing? Metroland was housing for transport. It’s all political and economic. This is a post industrial regeneration zone, housing opportunity area, Metroland, outer-suburban hub, end-of-line connectivity, and (NOT) London. How to solve that equation is beyond my competency but I am certain it is not a BCR. That set of circumstances is back on topic so no doubt more discussion will follow. The paused ‘solution’ is not a final one but the closest we have to implementation. One idea not dicussed is to privatise the Metroland franchise. That would be Marylebone, Chiltern and Baker Street terminus. You could call it GCMetJt. NW Metro: Marylebone-W Ruislip OHE and express loops at Sudbury & Harrow Rd, and Wembley Stadium. Limited stop service on Amersham line. Over twenty years divert all diesel service and the MK east west runs to NNML OOC terminus. Electrification of Amersham to Aylesbury which given existing would be DC rail. Implement the West Ruislip Metro terminus in conjuction with the departure of Central to Uxbridge. Mostly eliminates those scheduling and operation divisions. One could – almost – wish that the possibly-easier option of tunneling beneath Cassiobury Park to the originally-planned Watford Central station was going ahead. Another benchmark to perhaps consider is the Northern Line extension which, at last count I believe is going to cost £1.2bn. The straight line distance from Watford Met to Watford Junction is roughly 1 mile, about half the length of the NLE. If you also factor that an underground crayon from Watford met to junction could be done as cut and cover with much of it under the park, various car parks and roads, and only a handful of property acquisitions needed, you might well be able to do it within the cost realm of the current scheme, which is of course a much longer length of railway that needs a complete rebuild and to interact with NR. Apologies for the crayoning, but the real point is that the BCR of the Croxley scheme is now so bad that the money would quite likely be better spent on something else. I’m a fan of the Penryn style loop concept and believe the 30 and 20 minutes interval service could be supported. The loop outside the platform is interesting. With the fairly long layovers at one end a 30 minute interval could be supported by this arrangement but probably not the 20 minute service (reliably). An interesting hybrid scheme could be to construct the loop outside the platform initially but with design provision to extend the platform to a Penryn configuration later to enable 20 minute interval peak service if required. Are there any legal-type persons around who can explain the potential scope of a Mayoral Decision on TfL. What, if anything, would constitute an ‘ultra vires’ decision? I should be clear that I suppose that decision MD1478 was within the Mayor’s powers. I just want to know the extent of those powers. If I really was a cynic I would, notwithstanding the different legal frameworks, wish to compare and contrast with ‘Fares Fair’. The road cannot be lowered as it has to rise above the canal barges on the Grand Union. Measuring on Google Earth, the Met through Croxley towards Watford Met is broadly level at 66m elevation. The old branch falls gradually in the cutting from 63m where it passes under Tolpits Lane bridge to 59m on the embankment at its old bridge over the Grand union where the station run round loop started, the only bit of actual double track constructed originally. The old embankments approaching Croxley look ‘rough’ to be charitable and remember most of the branch was only maintained as a single track even though some of the earthworks and overbridges look like they were constructed originally with double ‘in mind’. I’m sure NGH is correct that not far short of 1 km of new double track construction on earthworks or bridge is required for a heavy rail link. Usual caveats regarding source data. @HERNED I’ve no detail, just commenting on the location. This is the isolated station embankment that won’t be reused. The Met line at the proposed junction / diversion point is about 8.5m above the existing branch line level the other side of the “gap” so the difference in height needs sorting. Some is new 8m some is rebuilt to 8m above local ground level so ~4m increase places. Aleks, has outlined some of the Road/Canal issues that need sorting as the best choices might not have been made in the past, for example the current branch line goes over the old Ascot Road but was sliced through by the new Ascot Road when it was built however the new railway alignment has to go over the New Ascot Road but preserving full road height for HGVs. Pages 11 & 12 for the section drawings. There was also some work needed doing underground with services and drains. With the road closures I understood that had been completed. Thank you for your detailed response, and apologies for querying the information in the first place. I would never have guessed the vertical difference between the two lines was as much as 8.5 metres, I know the area pretty well so I’m surprised. Proof yet again that I know nothing! The arrows on the plan for the old stations point to the wrong side of the bridges. Implies inaccurately one is being reused. What would you say the road links are after “sheet pile toe wall”? If they represent rights of way then that is impressive accessibility. It would have been good if the National Infrastructure Commission, from whose now departed head we have heard much in recent days, although not about infrastructure, had concentrated on their remit in hand, among other aspects looking at just WHY project costs constantly inflate in the manner described. Tripling of cost, or more, compared to a supposedly professional estimate, is nothing unusual. Every time it’s looked at another £50m is added, way beyond inflation. WHY. There is never an explanation of where the extra amount actually is. And at the end there is never an explanation or understanding about how those estimates along the way got it so wrong. When the estimate is done, there is a given quantity of material to be moved, concrete to be poured, ballast to be supplied, etc. The scheme has not tripled its length or anything like that. But if it is only being done on a series of guesses and outlines, nobody can work like that. You can go to a housebuilder who has just bought a field, look at drawings, and agree to buy it when built for say £400,000. And that is what you will pay when it is finished. You don’t get told progressively it is now suddenly £650,000, then £950,000, then £1,200,000. And housebuilders make far better profits than civil engineers, a straightforward and numerate profession. I’m not surprised the project got binned under these circumstances. By the way, it’s all about cost. I never saw any figures for what extra revenue it would deliver, to even cover its eventual operating costs, nor any assessments of passenger numbers. Given that it’s pretty parallel and close to the Watford DC line, some stations actually being within walking distance of one another, and that the citizens of Moor Park etc may use the Underground to Central London but not to get to schools, shops, or suburban offices, I doubt there would be a huge amount. No problem, I didn’t believe it was that much of a height difference either until I checked before making that comment, the penny then dropped as to how big the civils at that end of the line would actually be and hence where a good chunk of the costs are. Reviewing looks like branch was always single track on a double bed other than double track at the terminus and goods yard. This was a branch off the Rickmansworth line. For those of us who live in the area it comes a s no surprise that Herts CC couldn’t budget this properly. For a local authority who have a history of in adequate planning for school places and who cannot manage contracts even to fill potholes, planning a project on this scale was always going to be a step to far. A few years ago, they spent money looking at a tram system between Watford and St Albans which was never realistic as setting up an entire tram infrastructure, LMD etc for only a few miles of track was never going to be cost effective. It appeared at the time that HCC were naive about how to unpick a route out of franchising and NR hands. Last they muttered about this, was turning it into a guided busway….. This project has been talked about to my knowledge for 30+ years and I can’t blame the Mayor or Tfl for not wanting to pickup the dirty end of this stick. Although there are some tangible benefits overall it must be remembered that this project also involves closing the Met station (2016 entry/exit 1.84m) which is a problem for many. Spending a third of a billion pounds and lots of Londoners’ money on a project that benefits some people in Hertfordshire, and inconvenience others cannot be justified and everyone should be honest and stop wasting further time and money on it. Can someone remind me please why the plan didn’t just link up the 250m between the closed Croxley Green station and the Met line? From memory, the Met and the line from Croxley Green are the same height above the canal. Mr Beckton: You can have a fixed price contract for anything. But there are various snags. (1) The contract is valueless if the firm goes bust in the middle of it. (2) Firms rarely sign up to fixed price and fixed date, so you may have to accept “it’ll be done when it’s done”. (3) You’ll pay far more than a contract arranged on a different basis, as the firm has to cover itself for a range of risks. You may not have seen the estimates for operating costs, passenger numbers etc, but rest assured they were produced. Projects of this kind always have a BCR calculated, which requires these forecasts. Of course, we will never know whether they were correctly estimated, because the project is cancelled. If the scheme, or something similar, is ever revived, there will be brand new estimates made. ‘Fixed price contract?’ Oh, how we laughed. Eurotunnel was supposedly a fixed price contract. As Alasdair Morton in charge of the project said, in this business you quickly learn there is no such thing as a fixed price contract. You create a joint venture with a company who is notionally your rival – Two Cows Construction & Milk Supply Ltd – specifically to tender for a specific contract to create a replacement milking parlour and operate it. Failing that you at least create a wholly-owned subsidiary with limited liability. You tender for the fixed-price contract with payment in stages. You carry out demolition of the existing milking parlour and various other expensive bridge-burning tasks so the customer is committed. You explain you have hit some major unexpected snags (that actually you half-expected). You demand that the customer pay. If he doesn’t then you walk away. You have already factored in that this might happen on a few occasions so no big deal if he does. Repeat process as often as is necessary until end of project. Remember with the Metropolitan Line Extension we haven’t even got to this stage yet and we are already in trouble. Walk away. Walk away. Walk away. Malcolm : I suspect we both have some experience of this, but the scenarios you describe don’t really apply. The selected principal contractor, one of the national majors, coincidentally based in Watford, has not gone bust at all nor is likely to, and in any event this situation would be covered by Bonds. That’s what they are for. And such major organisations do sign up to fixed price work, that’s how from time to time they can make substantial losses on a single contract, due to some error on their part. But they will complete it, if only because it can cost them even more not to. They also will have a substantial estimating department who will give a project estimate, properly, to give a proper price indication for all. This will include calculating exactly what is needed to do the job, material quantities, labour hours, and fixing the price of the various subcontractors. I can only conclude that the various estimates given to date on this project have been done by non-construction people who haven’t a clue. A competent major contractor, with skilled civil engineering staff, will even work through the designs and come up with cheaper re-engineering, because it may help them to win the work over their competitors. Sorry forgot about the bit where customer announces that, as previously discussed, he now wants to have four cows. Contractor explains that is it wasn’t formally included as an option and the design precludes the addition of a couple of extra milking stations or even a larger milk storage tank. Moreover the drains and cess-pit have only been designed to be able to cope with the daily output of two cows. So any modifications are going to be very expensive indeed. Quite. As Mr Beckton says, fixed price contracts do exist in certain contexts. But in others (digging the Channel Tunnel is an obvious case) the notion is never going to work. The disagreement is whether one would have been possible for this Metropolitan Line Extension. Many would say no, based on experience of other perhaps similar transport projects. But even if it might have been possible, it didn’t happen, and we are now where we are. Google Street View suggests otherwise (compare the views of the two bridges from the A412 here https://www.google.co.uk/maps/@51.6520151,-0.4273072,3a,75y,6.33h,70.02t/data=!3m6!1e1!3m4!1sht4E026EBpwelzgDKG5wWg!2e0!7i13312!8i6656?dcr=0 – note that the LNWR track runs through, not on top of, the girders) , and comments above (NGH) suggest the difference is about 30 feet. Extending beyond the original station site would have required crossing the A412 at a very skew angle, and demolition of most of the houses in Sansom Close. And of course the original formation is not available anyway as it was severed to widen Ascot Road many years ago. (In the link in the previous picture, rotate the view by 180 degrees to see the other bridge – you can see we are looking up at the Met Line but down to the LNWR). And the vendor of the cows has the perpetual rights for the milk from one cow (the car park revenue) and it turns out that the 5th cow is actually a goat with large horns (the potential chiltern services). Exactly – Sansom Close is also a rather new development and part of the reason for my comments about WBC/HCC not making life easy/cheap for a scheme by allowing something to be built on sensible alignment. In terms of levels – Are you sure you aren’t thinking of the other disused Croxley line that is now the cycle path? @TIMBEAU Thanks. That makes sense now. I note that there is a similar junction to one that would be created using the Croxley Green station alignment, which is the one created by the LNER at Finchley (Church End) – now part of the Northern Line. The radius of that track turn is about 205m. But yes, I expect tunnelling the 25 meters under Ascot Road was a cost they were trying to avoid. It doesn’t seem that using a direct alignment wouldn’t have taken out much more than just the Harvester? It’s just looking at it this way, it doesn’t look like it would be that hard to join the purple arrow and the orange one. But what’s (not) done is what done. WBC obviously decided compulsory purchase of homes that they had relatively recently approved the building off might be a political no-no. The direct option is off the table as a result of the TWAO. I suspect a direct option might have been cheaper now including the CP costs. The alignment needs to have high line speeds to keep the additional unit requirement to just 1 unit hence no tight curvature. Note that the orange arrow is very close to street level and the purple one isn’t. As Timbeau has pointed out the existing Croxley branch formation follows the local ground level downhill from Tollpits Lane Bridge down the side of one valley of the River Gade valley (The Canal follows the Gade alignment). The new proposed alignment is effectively level from the junction with the existing Met (the Met line also runs up Hill into Watford station hence the desire to have the junction as far away from Watford Station as is sensible to reduce height issues) to the old track level at Tolpits. @ngh/PoP – you’ve missed the bit where we securitised the milk revenues, and sold them off to a passing venture capitalists, leased the cows to a COWSCO, used the cash to buy options on four more, which we then, in turn, sold and leased back via a doubledip vehicle in the Netherlands Antillies,whilst trading their milk futures for a tax certificate payable in yen in Jersey. Actually, there were never any cows, of course, but don’t let that trouble you; I have your cash…. There is no longer any such jurisdiction as Netherlands Antilles, which might make a double-dip vehicle located there even more tax advantageous. @answer=42 -when truth has been commoditised, who is a poor banker to complain.? Let me sell you some piastre-denominated bonds in the Submerged Log Company that you can stag later (with apologies to Flanders and Swann). I forgot to mention that one of the cows is pregnant so for accountancy purposes we can assume the future calf will be healthy and female and use this as collateral to take out a further loan to pay for restructuring. Also we have managed to persuade a finance company (or the government) to create special purpose vehicle (which isn’t a vehicle at all but it sounds good and could mean just about anything) to handle repayments. We have front-ended the payments to us but ensured that almost anything we owe is paid for in a few years time at the end of the contract when all the cows will be dead anyway and we won’t be getting any income. So when we default it doesn’t matter at all. We have both literally and metaphorically already milked the asset for what benefits it offered. You are indeed correct about the TWAO. I’m just trying to understand why the decisions were taken to design the project the way it was. If you scroll down to the OS maps show on http://www.disused-stations.org.uk/c/croxley_green/ the station platforms were raised up. The page also has photos from as late as 1990 showing the raised viaduct with the single platform station. The 2013 photo shows that the alignment is still there. I’m struggling to understand some of the decisions made too! Yes, croxley green station was above street level – but not as high as the Met across the road. It was (just) high enough to cross the canal and then descended so that the goods yard beyond the station was at street level. It is really a disgrace that £71m can be wasted like this. That money could have been used for so many other more beneficial purposes across the network. :-(. You probably won’t be pleased to learn that a Special Purpose Entity (SPE) is a specific case of a ‘pass-through fund,’ which sounds particularly disgusting. One terminology for the real owner is the ‘Ultimate Controlling Parent’, of which we probably all know a few. We may laugh but Graham’s post of 15:15 describes common reality. And no, the cows are indeed often fictitious but the tax credits are real. Disgrace? It depends on which way you look at it. I see the current abandonment of plans as a welcome recognition that, while “the system” can sometimes get things wrong (being directed by fallible humans and imperfectly organised), it is (at least sometimes) capable of recognising that a mistake has been made, and choosing the least harmful escape route. The alternative would be a body politic which makes plans and sticks to them through thick and thin (perhaps using the sunk costs fallacy) to pour astronomical sums of good money after bad, long after the error has become obvious to any unbiased observer. I’m 99% sure that routing the viaduct around the north side of the roundabout was the plan from 20+ years ago when I first saw a diagram in one of the railway magazines, perhaps the pub/Harvester was always considered untouchable! I’m not laughing that is why I brought up the cow analogy! I once worked for an SPV where the cows existed according to some contracts signed on paper, the design for the dairy existed on my harddrive but the tax credits existed and resided with an LLP who’s guiding hand has made a few Treasury Select Committee appearances on the subject of avoidance and is currently helping HMRC with their inquiries into a scheme that wasn’t quite set up correctly but has escaped their claws with 40+ other schemes so far. Shame, I would have been a regular user of it between Northwood and Watford Junction had it been built by 2016, but if it still takes a further three years to bring it into operation it will be too late for me. Although this section of Met reaches the outer edges of the GLA administration the comparisons to Waverley or preservation lines with cows is a stretch. In concept it’s more of a connection of two railways Met/LNWR like a smaller Shoreditch NLL (Old Station) and Shoreditch ELL with an intermediate station. That article makes interesting reading – but curiously, although it says there are 74 comments on it they do not appear. Is there a bug? Timbeau: You may remember that a while back the LR site was suffering from severe performance issues. An unfortunate side-effect of the (successful) efforts to fix this was the temporary unavailability of comments on certain older articles. How long this will continue is not known at present. Reading it now it makes me wonder how much a bench costs when building a station. I guess that the price differential between a railway bench and a B&Q bench is more than a tenner…. The 1st Croxley article – I suspect some of those comments might have suggested those prices were unrealistic…. It would be good to have all the missing comments back on all the articles. Having just signed off some parish expenditure for a memorial wooden bench, the total cost, including weatherproofing and installation, turned out to be about £800. That struck me as well above B&Q! [I dare say that NR would find further ways of inflating that price]. Much as I’m laughing at the ‘two cows’ jokes, this feels like another in the Edinburgh Trams mould of how not to run a project. I have long been of the opinion that this project disbenefits London, as it encourages people from Harrow to shop in Watford rather than in Camden, or somewhere else close to Baker Street. The infrastructure from Watford to London is already there and unchanged so it gives little benefit in the opposite direction. I don’t think that the contingency date for starting necessarily means that the TWO has expired though – if work had started by the real end date, a further TWO would be sought and the work would continue. I will cheer when the TWO actually expires though, as with the fares freeze Sadiq has better projects on which to spend his money. “Temporary” as in the Newhaven Marine sense? The comments for the older Croxley article are on line in the Wayback Machine. Some people have got it worse. The New York Times has recently published an investigation into the exceptionally high construction costs in New York. Maybe we could learn from what they get wrong though. Thanks for making the effort to link the wider discussion, always appreciate a fuller viewpoint. I had not appreciated the possible relief at Marylebone from Aylesbury. It could be a long pause for multi-tracking & E-W. It seems that the planning system failed to preserve the possibility of undertaking what should have been a reasonable project at a sensible price. Too many small decisions were made without taking regard to the bigger picture. There should be a reflection about what went wrong before the same outcome occurs for a larger project. But I doubt that this will happen – in the UK, it is too easy to blame planning as a principle rather than look carefully at how it can be approved. @ Taz – as I have already remarked in this thread of comments but my remark was either dumped by the server or deleted by the mods / editor Mike Brown updated the Assembly Budget Cttee on the MLE a week ago. He said the project was not “dead” and that TfL’s funding remained intact. He said that the other funding partners were seeking HIF (Housing Infrastructure Fund) monies but could not say when the government would respond to the funding bid. Therefore someone is trying to find some money but it isn’t TfL or City Hall. I assume that if funding is released then a practical way of resuming work will be found *if* the revised funding settlement is to TfL / City Hall’s liking. I am not holding my breath that the project also goes ahead having been placed on its death bed more than once. Consent lapses unless development is begun within three years of the date on which planning consent is granted. So the corpse is still warm? Yes – but it doesn’t appear to be twitching. Nailed to a stick, wrongly sold, and repeated ad nauseam for 50 years? A perfect analogy Graham!! Reading between the lines and the spin, Harrington claims to have got funding for the budget shortfall, but there is still no contingency funding, let alone underwriting, for any cost over-run. Khan wouldn’t take on the risk, even with the DfT giving TfL the shortfall between the budget TfL agreed when taking on the scheme and the current budget, and TfL gaining development income. This sentence starter from a letter from Javid (Sec State Housing, Communities & Local Government) and Grayling is savage: “Considering the lack of confidence you and TfL have in the budget you had set for the scheme”. 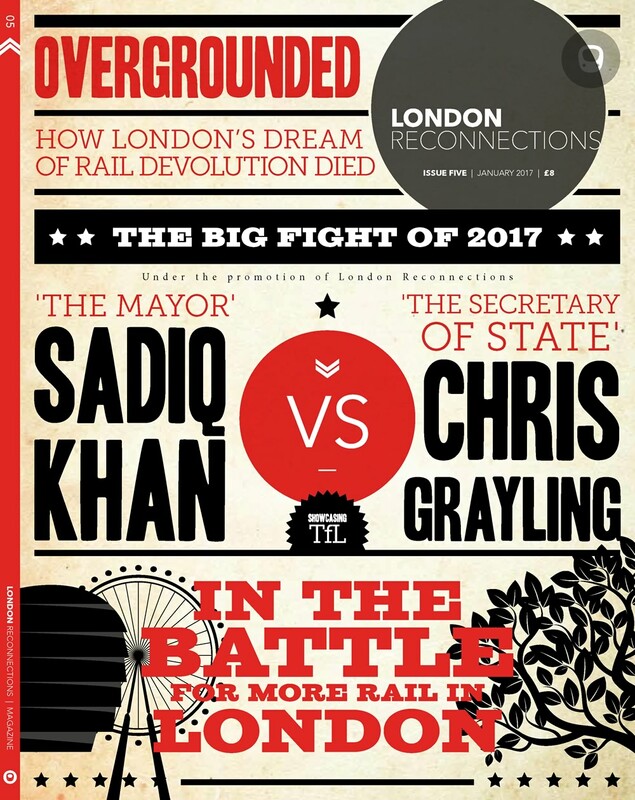 I doubt it will be soon before the DfT offers to part fund a scheme TfL is managing – the Grayling-Khan feud isn’t the problem now – its TfL giving off the impression that they don’t trust themselves not to have spiralling costs. The own goals by all sides in the handling of this project will have long term negative ramifications that go far beyond a short rail link in Herts not being built. That’s agreeing with the Treasury view of events. I suspect TfL have the opposite view… By now, I believe the good burghers of Watford may have had the bad news broken to them, anyway. Hopefully, but not expectantly, they will now understand that they are not going to get this and had better start planning accordingly. @Graham H: I suspect Kahn is trying to avoid a big bear trap. Given Grayling’s well known willingness to play politics, I suspect the £73m came without any arrangements for what would happen if the project overran. Let’s face it, the way this project has gone, by the time it would have been completed it might have cost as much as two bridges, one rather longer than the first, which have been promoted by a recent mayor! So is it dead now, or is this a desperate attempt to use the media as a tool to beat a political opponent with, and firm up the myth that everything is Kahn’s fault? How wonderful to see a comment in black, making it so easy to read. My aging eyes find the grey and very light weight font on a white background as usually used increasingly difficult to read. I suspect I may not be alone. Could all comments not be in black, please? I add my own plea for more-readable text. Could all comments be in black, please? Or at least something more readily readable than the present ghost text. Yes, please!!! The Friday reads particularly are near impossible to read! I think it is bold black, rather than bold grey – this is bold grey. The bold/black would be useful, would mean I could turn magnification down for the page. I miss the inverted colours theme. @LBM what’s the rough ETA for the article, please? There’s a solid lack of factual info out there atm if anything has changed. @LBM I’m looking forward to the article too! Any chance of seeing a breakdown of the costs – where the money would actually go? Firefox users can disable custom colours and fonts with View | Page Style | No style — that may help if you find the text too thin. Yes – I thought this new look was just a temporary glitch. And here it is still, months later, in spite of it being so horrid…. The old system was so much more useful and practical. Did I miss something – don’t keep me hanging on like this – is there another thread – please………. @Thickmike – No, not yet but I guess the author may be trapped on Discworld or similar… Hold on and and we may find out. Thanks Graham – just seemed like a whole slew of information and posts and then – silence. I’ll wait – I’m a patient soul – I used to be a trainspotter and you learn patience as a young person with that hobby. 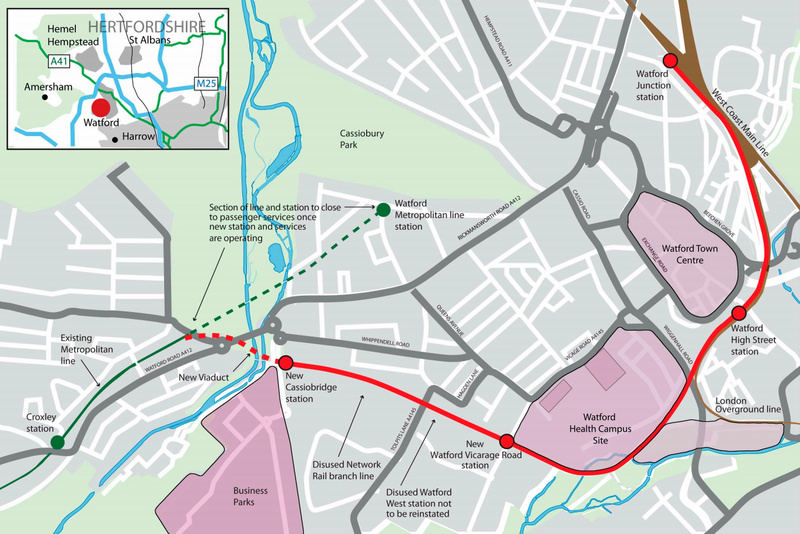 I see ( thanks to Ian Visits ) that Watford Council are off in fantasy-land suggesting a “light rail system” to replace the cancelled extension. @Greg – well the Mayor (of London) proposes a crayons busway as something he’d be willing to use the money on in West Watford, so it is only fitting that the Mayor (of Watford) upscales it to some more high quality crayoning that would be of a similar budget to the tube extension to try and keep the DfT and TfL cash around. And, of course, the light rail scheme has great pedigree at being a proposal when the tube link isn’t on the table, and last time it was around, it lead to someone eventually saying ‘this scheme is rubbish, for the same money the tube link can happen, let’s just do that instead’. AFAICS, worse case isn’t ‘build nothing’ but ‘build pointless busway’. Resurrecting light rail plans are a good way of blocking it even if the money doesn’t stay around.